We got our first snow in NYC over the weekend, but I wasn’t even mad because I had a reservation at Russian and Turkish Baths in the East Village. I went with Karina, who has been to a few other bath houses before the one we went to on Saturday. It was my first time going to a bath house and I must say I thoroughly enjoyed the aromatherapy rooms. It’s perfect for a cold day! 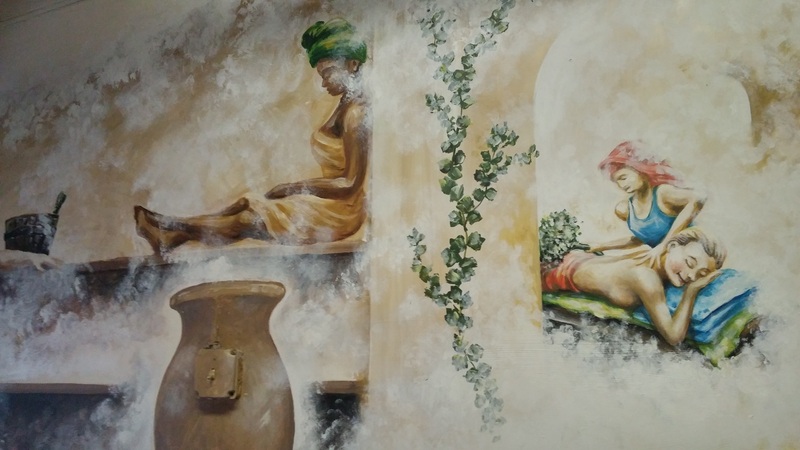 The mural above is on the wall in the hallway outside of Russian and Turkish Baths. I love how the entire painting has a steamy vibe to it, making it look so relaxing and dreamy. If you’re thinking of going to a bath house or spa in NYC you should definitely check out Russian and Turkish Baths for a couple of hours this winter!